A Smartwatch That Doesn't Need to Be Charged. Finally. Swatch, purveyor of inexpensive watches you buy on layovers, plans to release a smartwatch within the next three months that will connect to the internet without needing to be charged. That's a revved-up idea. The new Swatch will be released roughly at the same time as the hotly anticipated Apple Watch, which reports suggest could have catastrophically terrible battery life. 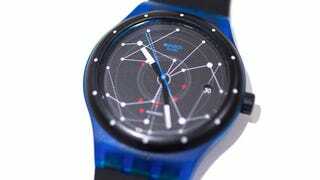 Swatch confirmed its plans in an email to Gizmodo, but details on what this watch might look like or do are slim, except that it will be able to connect to the internet without a charge and that it'll be compatible with both Android and Windows phones. Even the best smartwatches have the fatal flaw that they need to be removed from your wrist at least every couple of days and connected to power or else they stop working. And if the reports about the Apple Watch are correct, it might need a charge every few hours. A watch that needs to be charged constantly ultimately isn't useful. Eventually, you will look at it to tell you the time and it will be dead.